Connect New Zealand designed and installed Directory Boards for the Vero Centre and other Auckland buildings including the National Bank Centre. The Vero Centre is recognized as New Zealand’s premier business address. To provide visitor information boards to match the overall high quality of the building, the owners chose Wallflower to provide the most flexible solution. A series of custom built stainless steel units house 42 inch Samsung displays. 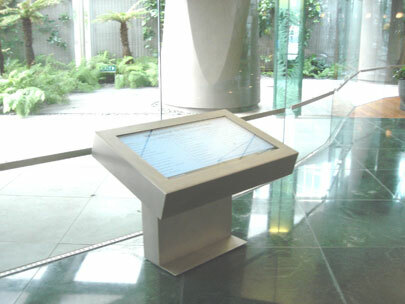 Each display shows a Directory list and information about the centre. The Tenant List is maintained as a simple Excel spreadsheet that is continually monitored by Wallflower Dynamic Digital Signage Software. As Tenant details change the management staff update the spreadsheet and Wallflower Dynamic Digital Signage Software immediately updates the Directory Board. Wallflower Dynamic Digital Signage Directory Boards can also incorporate features such as live Webcam views from the building, weather information and newsfeeds as appropriate. They may also be interactive and include an implementation of the Wallflower Navigator. Visit www.kipt.co.nz/n19.html for details of the Vero Centre or www.kipt.co.nz/n65.html for details of the National Bank Centre. For information about Connect NZ visit www.connectnz.co.nz/AboutUs.asp.